The New York Knicks, unsurprisingly, aren’t on the meeting list Kevin Durant has set up for himself at the beginning of free agency. However, Carmelo Anthony is hoping that his recruiting talents, questionable as they may be, can help improve the team’s odds in this matter. Durant, coming off an excellent season with the Oklahoma City Thunder, his ninth with the team, is planning on meeting with Thunder reps, the favorites to land him, but also with the Golden State Warriors, San Antonio Spurs, Miami Heat, Boston Celtics and Los Angeles Clippers. The Knicks, despite their cap space and the addition of Derrick Rose, aren’t in the picture. 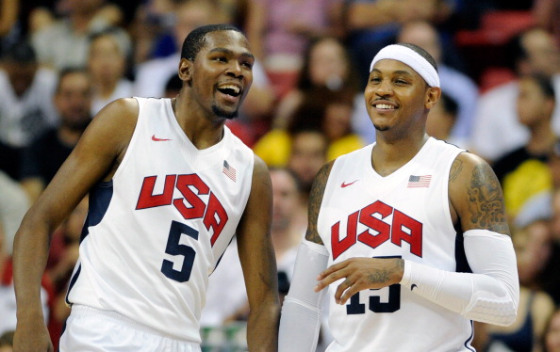 Anthony, who is playing next to Durant on the Olympic team going to Rio de Janeiro, plans on using this closeness to convince Durant otherwise. You know, for me, it’s more just about just laying it all out for him. Being in that situation before and knowing how much he has to think about‎ and what he has go through, him not wanting to leave Oklahoma ‎after all the time that he spent there, ‎I felt the same way when I was in Denver, spending 7½ years there and then to have to make a decision. But you leave it up to him. He’s going to make the best decision for him. I think that’s the most important thing. Durant has been asked a number of times about the Knicks. He hasn’t said anything about scheduling a meeting with them, but has mentioned they look better with the trio of Anthony, Porzingis and Rose. Yet it seems unlikely he’ll end up going there, or even meeting with them. Durant isn’t after more or less money – he’s getting the max anyway. That’s not the question. It’s a matter of having fun and putting himself in a position to win a championship, while probably maintaining his dominance. Anthony might be a friend and teammate on one gold medal, heading towards two. But even with Durant, the Knicks have a lot of question marks and holes – defensively and on the bench. Durant might not want the perfect and easiest situation (Spurs? Warriors? ), and my personal guess is that he’s leaning towards staying in Oklahoma City: A very good team, with Russell Westbrook, and obviously more money than anywhere else. Maybe something sways him in the next week or so, but it’s not going to be the Knicks. They’re not good enough yet, or ever will be. The just-as-burning question about Durant will be whether or not he signs a five-year deal, or looks for an earlier exit. It’ll be both to maximize his earning power and take advantage of the constantly rising salary cap, but also to give himself an out. He might be loyal to the Thunder, but it’s all to a point. If he feels that this team can’t win a championship, even with him, he’ll be out the door to the best offer waiting for him.